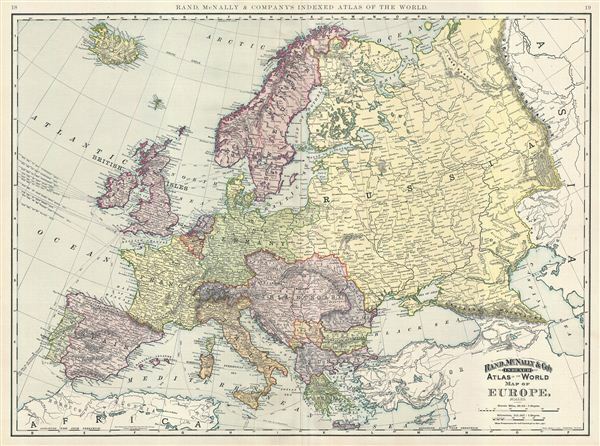 This is a beautiful example of Rand McNally and Company's 1891 map of Europe. The map covers the continent in its entirety from the Atlantic to the Caspian Sea and from the Arctic Ocean to the Mediterranean Sea and includes Iceland. This map depicts a period following the unification of Italy and the rise of the British Empire to its apex of power and influence. It was also a time of decline for the Ottoman Empire. This map follows the period after the unification of Germany. Various submarine telegraph lines are noted. Color coded according to regions and territories, the map notes several towns, cities, rivers, railroads and various other topographical details with relief shown by hachure. This map was issued as plate nos. 18 and 19 in the 1895 issue of Rand McNally and Company's Indexed Atlas of the World - possibly the finest atlas Rand McNally ever issued. Rumsey 3565.006 (1897 edition). Philip (atlases) 1026 (1898 edition).